Thank you for visiting today! Holyland-Gifts is dedicated to supporting the small number of Christian families remaining in the Holy Land today. Here, you’ll find a wonderful selection of gifts from the Holy Land, along with church fundraising ideas and much, much more. No visit to www.Holyland-Gifts.com would be complete without information about where these unique, beautiful items come from. While Christians from all over the world make pilgrimages to Bethlehem, Jerusalem, and other Holy Land destinations, the actual number of Christians living in the Holy Land has dwindled dramatically. Once making up a large percentage of the population, Christians are a Holy Land minority today, particularly in Bethlehem, where they make up less than ten percent of the population. As a minority, these Christians are often subjected to injustice, persecution, and horrible hardships. It is very hard for them to make a living. That’s where Holyland-Gifts comes in. Incredibly, all the beautiful products you see here are handcrafted by a co-op of just ten Christian families living in Bethlehem, West Bank – Israel. Importation of these unique handcrafted items accounted for more than 95% of the income provided to this group of Christian craftsmen and their families between 2001 and 2012. In 2001, Holyland-Gifts was founded in St. Louis, Missouri, as a fundraising project for churches in the area. By 2003, www.Holyland-Gifts.com was established to expand the program throughout the United States, and to expand our ability to provide financial support to Holy Land Christians. Today, we offer an incredible selection of gifts from the Holy Land, and we offer churches from across the nation to participate in fundraising and mission project opportunities. When your church participates in the Holyland Gifts fundraising program, you will receive a kit that contains all materials needed. Your church will keep 25% of the total sales. If your church participates in the Holyland Gifts mission project, you will receive a kit containing all necessary materials and 100% of the profits from your sales goes to Christian charities in Bethlehem. Take a look around! You’ll find a fantastic selection of Christian gifts suitable for any occasion. All of the gifts we offer here are made from sustainable olivewood and mother of pearl. The olivewood used to create the gifts we carry is sourced from branches pruned from olive trees that need to be maintained; olive groves are not cut down to serve as wood for these gifts. The mother of pearl the artisans use is shipped in from Australia, where it is an abundant byproduct of that country’s shellfish culture projects. Using nothing but these simple natural materials and a few humble tools, Bethlehem’s Christian artists carefully craft the gifts we carry. These gifts include olivewood nativity sets, handmade Christmas ornaments, wooden crosses, statues and sculptures made from olivewood, necklaces and other jewelry made from both olivewood and mother of pearl, and beautiful rosaries in olivewood and mother of pearl. Olivewood Carvings – Not only is the wood of the olive tree very beautiful, it is remembered as the one of Jesus’ crucifixion, making it even more meaningful. The olive tree has always been prominent in the life of the Holy Land’s people; while we read about it in the Old Testament, we also see it today, still providing nutritious food and oil, plus soap and many other products; for example, the tree’s leaves have some medicinal purposes. The wood is naturally twisted and burled, with gorgeous color variations you can see in the beautiful handcrafted Christian gifts we offer. Mother of Pearl Jewelry – The Mother of Pearl shell used is no longer obtained from nearby sources as it once was; but Mother of Pearl shell is nothing new to Holy Land artisans. It was first introduced to Bethlehem by the Crusaders during the 12th century or so. In Bethlehem, the same kind of tools used in ancient times are still used today to create the pieces we offer; for the most part, the only tools used to produce these amazing works of art are primitive. They include a coping saw, a small chisel, and a file, and many pieces of the jewelry we carry require as many as 1,000 strokes with these hand tools to complete. First Communion Gifts – check out the mother of pearl rosary or bracelet; these are very popular. • Confirmation Gifts – Any meaningful Holy Land gift works well for confirmation. Many of the gifts we offer are richly symbolic, making them ideal for anyone who is being confirmed. Baptism Gifts – A Baptism is an important part of any Christian’s faith formation. Whether giving a gift to parents, Godparents, or the recipient of the Baptism, the gift you choose should be meaningful. Whether it’s a cross to symbolize new birth as a Christian or any other gift, the gifts we carry are unique and are often very difficult to find at other Christian stores. Wedding Gifts – Instead of yet another toaster or some other duplicated item, why not give the bride and groom a gift from the Holy Land? 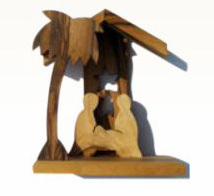 Our Holy Family sculptures are an ideal way to celebrate the formation of a new family. Birthday Gifts, Anniversary Gifts, and Graduation Gifts – All of these important milestones call for special gifts. Make them more meaningful and special with a thoughtful gift from the Holy Land. Easter Gifts – While there is no denying the value of a good piece of chocolate, it is important to remember that Easter is all about the Resurrection of the Lord. Include a little gift from the Holy Land in your child’s basket as a lasting reminder of the value of salvation, and don’t forget older friends and relatives. For about the same price as a trinket, you can give a lovely, heartfelt Holy Land gift. Christmas Gifts – In our pursuit of economical gifts for Christmas, we often forget that some of the most amazing treasures available are very inexpensive; and, more important, they are meaningful gifts that will be enjoyed for years to come rather than ending up at the bottom of a drawer after a few weeks or months. Some of the most popular Christmas gifts we carry are our ornaments and our nativity sets. Crosses and jewelry are also high on the list. Once again, we thank you for visiting Holyland-Gifts. If you have any questions, please contact us; we’ll be happy to answer your questions right away.